These New Year's Eve party favors will help your party be a hit this year! Your kids and party guests will love to crack these open at midnight. They can be filled with candy and small toys, or fill them up with confetti! 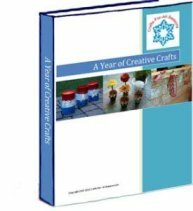 This craft is easy enough for children to make. Keep them all in a basket and hand them out right before midnight!Adults can also have fun with these. Roll up jokes inside, or write down some type of action or statement they must make sometime through the night. They should keep their action a secret to surprise the other guests. It is such a fun way to get everyone laughing! 1. First measure 6 inches on the papertowel tube and mark with a pen. Then cut at the mark, to get a tube 6 inches long. You can throw out the short end. re. 2. Measure three inches (halfway) into the 6 inch tube and mark this, and cut along the mark. You now have two tubes 3 inches long. 3. Cut a piece of wrapping paper approximately 8.5 inches by 11 inches (same size as a standard sheet of paper). Place the two tubes on this paper, leaving a one inch gap between the two pieces. 4. Roll the paper around the tube, and tape shut. Do not put the tape over the 1 inch section gap, or it might be harder to "crack" the popper open. 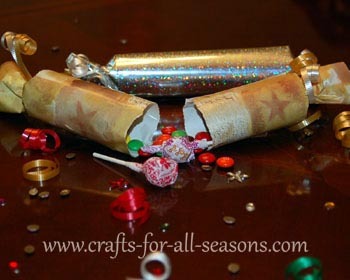 Then, twist one end of the wrapping paper at the end of the tube, and secure with curling ribbon. Curl the ribbon with the edge of the scissors. 5. Add your candy and goodies into the tube. Then, tie up the other end and add the ribbon. Happy New Year!